Help save “the king of butterflies!” Join environmental leaders from The North Carolina Arboretum and Bee City USA along with international monarch butterfly expert Estela Romero for a special monarch conservation mini-symposium on Saturday, September 22, from 9 a.m. – 1:30 p.m. inside the Arboretum’s Education Center. Learn about these fluttering beauties, their habitats and migration patterns, along with the latest research and methods to help conserve these essential pollinators. Tickets are $35 for Arboretum Society members and $40 for non-members. Lunch is included with your registration. Following the symposium, a special screen of “Flight of the Butterflies” will be held at 6 p.m. in the Arboretum’s Auditorium followed by a Q&A with Estela Romero. Registration is required, parking fees waived for mini-symposium participants. Click here to register. Based in Angangueo, Mexico, Estela Romero serves as the local news reporter for the Journey North citizen science and education program. In this role, she involves children from her local community in reporting the monarchs’ fall arrival, sending news about the monarchs’ overwintering season and announcing the butterflies’ departure for spring migration in March. During the winter, Estela also coordinates the Mexican side of The Symbolic Migration, a program uniting children across North America through the migration of paper ambassador butterflies. This fall, 60,000 students will create symbolic monarch butterflies and send them to Mexico. In 1975, Estela was a child living in Angangueo when the monarch overwintering sanctuaries were first “discovered.” Her family has a long history living in the town, as well as working with of the first scientists who came to study the monarchs. For more information on Estela and the monarch programs she works with, please click here. Working in the field of education for more than 20 years, Kim Bailey has enjoyed a wide range of experiences, including teaching middle-school life science, leading wilderness adventure trips, directing outdoor education programs, training teachers and naturalists, developing curriculum and managing a network of environmental education websites. She has also volunteered for the National Wildlife Federation’s Habitat Stewards, Master Gardeners, Master Pomologists (fruit & nut specialists), Georgia Native Plant Society, Monarchs Across Georgia and Bee City USA. Kim first visited the monarch butterfly overwintering sanctuaries in Mexico in 2002 and has co-led several trips to the area since then. She now enjoys growing milkweed, wildflowers, fruits, and vegetables while learning more about the pollinators that also make their home at her farm in Fruitland, N.C. For more information on Kim and Milkweed Meadows Farm, please click here. Researchers and professors at Winston-Salem State University and the Center for Design Innovation, Dr. Nick Hristov and Dr. Louise Allen are pioneers in utilizing laser scan technology to estimate wildlife populations. Their technique uses a system called Light Detection and Ranging, otherwise known as LiDAR. The annual winter coalescence of monarchs not only creates a breathtaking visual spectacle, but provides an unparalleled opportunity to assess their numbers. Dr. Hristov and Dr. Allen have already proven LiDAR to be an effective tool for gauging populations of hibernating gray bats, a species that exhibits dense-clustering patterns comparable to overwintering monarchs. They are now implementing LiDAR technology to make more accurate measurements of the monarch overwintering colonies in both California and Mexico. 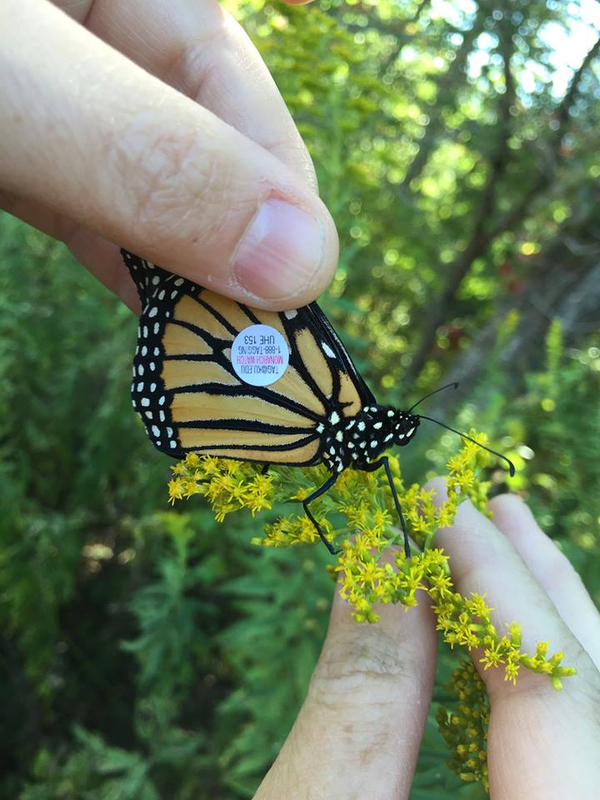 Bringing increased precision and accuracy to the science of documenting monarch populations can ultimately lead to more effective conservation efforts. For more information on Dr. Hristov and Dr. Allen and their research, please click here.